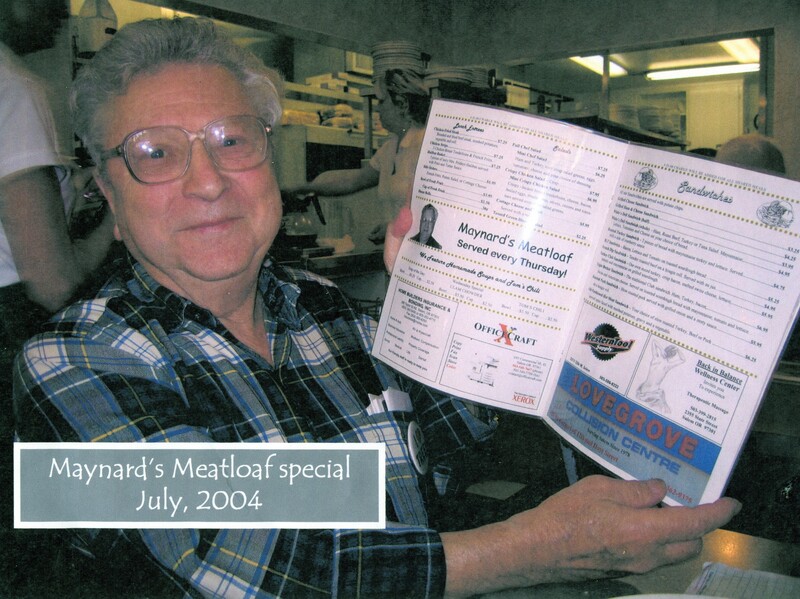 Maynard Drawson holding a White’s Restaurant menu featuring Maynard’s Meatloaf special. White’s Restaurant at 1138 Commercial St. SE is a Salem landmark of restaurant history. Charles and Myrtle White had previously owned White’s Tip Top Lunch in the Hollywood District of Salem during the early 1930s. When they moved their family to South Commercial St. in 1935 they built a new restaurant, White’s Lunch, on the property adjacent to their home. Service and satisfaction were very important to the White’s as stated on the cover of their early menus. Original hours were seventeen a day from 8:00 a.m. to 1:00 a.m. seven days a week. A “plate lunch” special consisted of meat, two vegetables, trim, bread, beverage and dessert for 35 cents. Ten years later in 1945 son Bob and wife Carole took over the daily management of the restaurant. Plate lunch was still the daily special, though the cost was now 60 cents. Same hours of operation but only six days a week. After World War II Bob’s brother Kenny built White’s Drive-In next door to the original restaurant. It operated from 1948 to 1955 and shared a common preparation area. French fried shrimp on a toasted bun with a side order of French fries was one of the more popular menu items for only 85 cents. As the years marched on, Bob and Kenny brought their wives and children into the family business. In 1963, a major remodel took place. The original White home adjacent to the property was moved to make room for more parking. The inside of the restaurant was updated to increase seating and modernize the kitchen. The “plate lunch” was replaced on the menu by daily specials for breakfast and lunch. Homemade soups, sandwiches, dinners, salads, and desserts remained popular menu items. In 1981 Bob decided to retire and put the business in his wife’s name. Carole continued to run the business with sister Judy Haskins and daughter Debbi White Strauch until 1989 when the business was sold. The White family retained ownership of the restaurant building itself. The new owner operated the business until filing for bankruptcy in 1995. At that point Bob and Carole White stepped back into the picture to reclaim the business name. One morning during breakfast in the Ritz Diner over at the corner of State St. and Lancaster Dr. they met Don Uselman. After watching Don cooking the food, talking to his customers and greeting every person that walked through the door Bob told Carol, “I could see that man running my grills.” A friendship was established and after much planning and preparation Don Uselman and his wife re-opened White’s Restaurant in 1996. What makes Maynard’s Meatloaf so special? The secret ingredient, carrots. And just in case you were curious, here’s the recipe from the Maynard Drawson collection currently held at the Willamette Heritage Center. Mix all ingredients together in a KitchenAid mixer at #3 for 3 minutes using the flat mixer attachment. This will give you all the sinew and gristle mixed up on the mixer attachment. Throw away this part as it will make your meatloaf much more enjoyable to eat. Put remaining mixture into a loaf pan and push down by hand. After packing the loaf pan, bang the pan on a solid surface to pack. Bake in a preheated oven (325 degrees) for 90 minutes until meat thermometer reads 160 degrees. This entry was posted in History Experiences, People, Uncategorized and tagged Bob White, Carole White, Charles White, Debbi White Strauch, Don Uselman, Hollywood District, Judy Haskins, Kenny White, Maynard Drawson, Maynard's Meatloaf, Myrtle White, Oregon Heritage Tree Committee, plate lunch, Ritz Diner, White's Drive-In, White's Lunch, White's Restaurant, White's Tip Top Lunch. Bookmark the permalink.